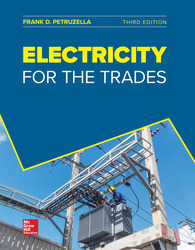 Electricity for the Trades, Third Edition, sets a standard for textbooks on electrical training. Frank Petruzella is a tradesman with more than 30 years of experience. This well-illustrated text provides an excellent foundation of electrical and electronic principles. This text prepares students for specialization in the electrical trades or one of the many related trades that require a special understanding of electrical fundamentals.